Virtuoso dollmaker Kaye Wiggs was presented with Jones Publishing’s Lifetime Achievement Award at the 2015 International Doll & Teddy Show in Asheville, N.C. The Australian artist graciously took the time to write the following short autobiography, with assistance from Grace Szczepaniec of Jpopdolls.net, for DOLLS magazine. I grew up on a farm near a small town in Australia called Quirindi. I was (am) the oldest of six children. We had sheep, horses, cattle, pigs, chickens and ducks. My daily chores included rounding up the cows to be milked each day and looking after the chickens and ducks. I loved farm life. I, along with my two sisters and three brothers, went to the local Catholic school. I was very good at math and science, and I have remained interested in science (particularly astronomy) all my life. I have my own telescope and love looking at all the interesting things in the night sky — it gives me such a feeling of awe to see the beauty and the vastness of the universe. We moved into town when I was 14 years old and I have missed farm life ever since. I married my husband Brian when I was 32 and had our daughter 10 months later, then my son three years later. My husband is a pilot, so we moved around Australia for many years, then settled in Tamworth when our children were starting high school. We recently bought a house on a small acreage, so I feel like I am finally home. I plan on having chickens and growing my own organic vegetables and fruit next spring, when I hope to be all settled into my new home. My hobbies include astronomy, bonsai, photography, and of course dolls! I collect dolls and vintage perfume bottles. I guess you could also say I collect vintage lace. I am a laceaholic, but I have a good excuse for having a big lace stash — I can use it for my dolls. My fulltime job is making dolls. I believe I have the best job in the world! I have always been interested in art. Before making dolls, I used to do ink and pencil drawings and oil paintings. 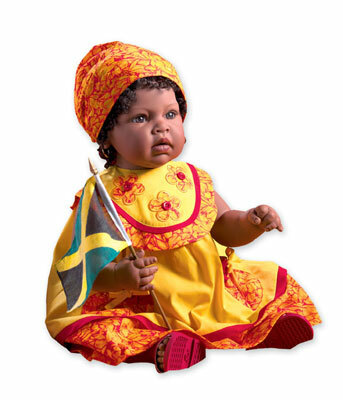 I have always loved dolls, and when my daughter was small I wanted to give her a special doll. But I couldn’t find one I liked in the stores, so I decided to make her one. I made her a soft-sculpture doll, and when friends saw it they started asking me to make one for their daughters, so I made some for my friends as well. Then I decided to try making porcelain dolls, so my husband bought me a kiln and my first set of greenware. I had no idea how to fire or paint the dolls, so I bought a book and taught myself from that. I made reproduction dolls for a few months. Then I sculpted my first doll in 1989 using porcelain clay, then made a mold and cast her in porcelain. I entered her in a competition at a doll show in Canberra and won first prize. Soon after, I received a phone call from a lovely lady named Renee who owned a mold-making business in Australia called JR’s World of Porcelain. Renee asked if I would be interested in having her make molds and sell them in Australia and the U.S. I agreed and sculpted my first doll for sale as a mold —a little boy I called Scallywag. Renee offered the molds under the name DownUnder Dolls. We worked together for a number of years, and we remain good friends to this day. Renee introduced me to a U.S. mold-making company. Then I was asked to design dolls for Home Shopping Network, which I did for a few years. I travelled to America twice to appear on the HSN shows on TV (a nerve-wracking experience, as I am extremely shy). I continued making dolls for molds and for HSN for a while, but I became very sick and found it hard to get out of bed each day. I was eventually diagnosed with chronic fatigue, IBS, and fibromyalgia. I could no longer make dolls, so I retired. I eventually found a doctor who practiced natural therapy as well as regular medicine, and he helped me overcome my illness using diet, natural therapies, and vitamin B12 injections. I threw away all my prescription medication and have never taken so much as a Panadol since. I have learned to manage my pain without drugs. Around 2003, I discovered ball-jointed dolls (BJDs) when a doll friend visited me and bought a magazine with BJDs in it. I was enchanted by the dolls and wanted one! I knew this was my new path! I had so missed being creative and wanted to start making dolls again, so I set about teaching myself how to make silicone molds for casting resin. I spent a year researching and experimenting until I could make a useable mold. I purchased a Souldoll Clara and used her as a guide for sizing when I made my first resin head. I cast three copies of that head and sold two to a lovely lady in the U.S. That gave me the confidence to make a full doll, so I sculpted my first full BJD, Matilda, and sold her in an edition of 20 human and 20 elf. I cast, sanded, and painted each doll by hand. I continued to make more heads to fit Matilda’s body and sold those in editions of 20. Then I became allergic to the resin, so I decided to make just the heads again and sculpted Poppy, Pepper, Pip, and Nettle heads and sold them in limited editions to fit SD-size bodies. I was so badly affected by the allergy that I figured I had to either give up making the dolls or have someone else cast them for me. I discovered a company in China that would cast for artists, so I sculpted a tiny doll named Sage. That didn’t work out well, as the company made some changes to my sculpt that affected her ability to pose. I had to alter each doll before I sent them out to my customers. Then I decided to try casting again, so I sculpted an MSD-size doll named Annabella. I sold some Annabella heads, but the allergy returned. Around that time, Grace from Jpopdolls was also very sick and we started talking about what to do for the future. We decided we could work as a team to have my dolls produced, with Grace being my distributor. We started by offering Annabella elf and human in editions of 50 each. Since then Grace and I have become good friends and we have enjoyed a number of years working together, producing many loved dolls, including Talyssa, Layla, Mikki, Nyssa, Nelly, Maurice (my first boy), and many others. 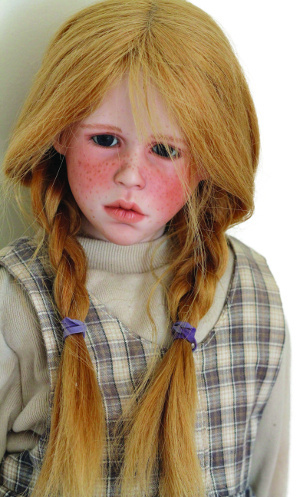 The dolls range from SD size to tiny, all sculpted by me and reproduced by our factory. I am also a supporter of several charities, both animal and human. One of my favorite is Asian Aid and Three Angels Nepal. Both organizations work to save children and young people from prostitution and slavery. In 2011, I sculpted a doll and named her Hope. Grace and I sold the doll in an open order and we managed to raise nearly $100,000 with the help of our community. The money went to build a water-purification system and to purchase a water transport truck to supply water to other communities, as well as their own. I regularly paint dolls and dress them to be auctioned to help my charities. For the future, I will continue to work with Grace and create new sculpts for our collectors. I will also start making some very limited edition dolls myself that will be offered to my collectors. 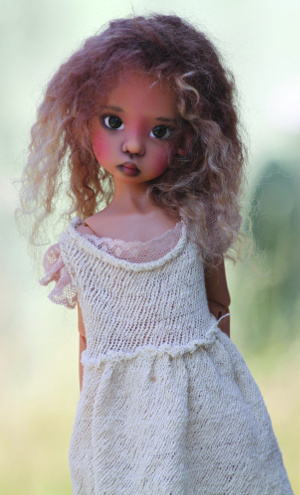 I am working on making porcelain BJDs, as well, for collectors who want my exclusive dolls.